New Year’s Day, another lazy day. Brian was off from December 24 until January 5 and we had the ultimate stay-cation. Blaise started Brian’s time off with a 104 fever, which he then passed to Laine on Christmas day, and Saige joined in the sick club with a cold (no fever). The entire time he was off someone was battling some sort of ailment. Even Brian and I enjoyed a slight cold. 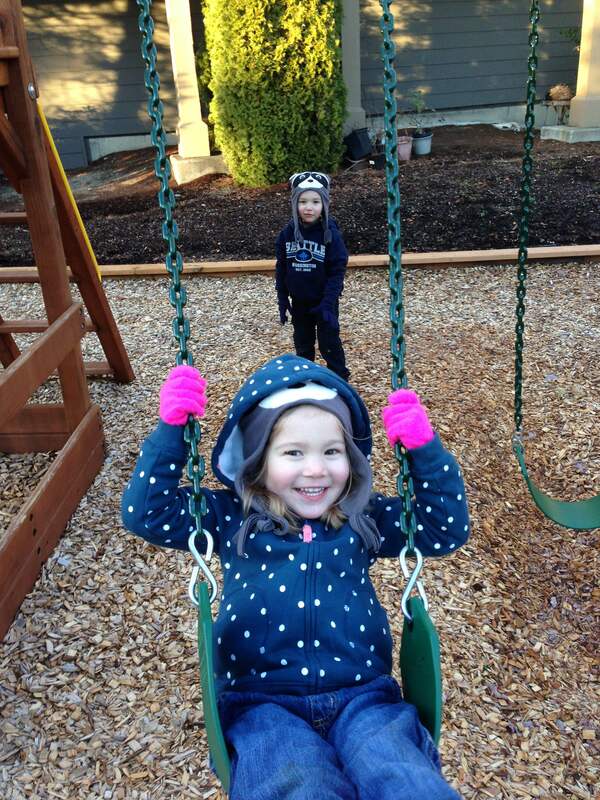 Blaise and Laine were good to go on New Year’s so he took them out to a movie and then to the neighborhood playground across the street. Saige and I stayed in and enjoyed the quiet. For Christmas, the kiddos were gifted an art bin with a ton of random supplies. 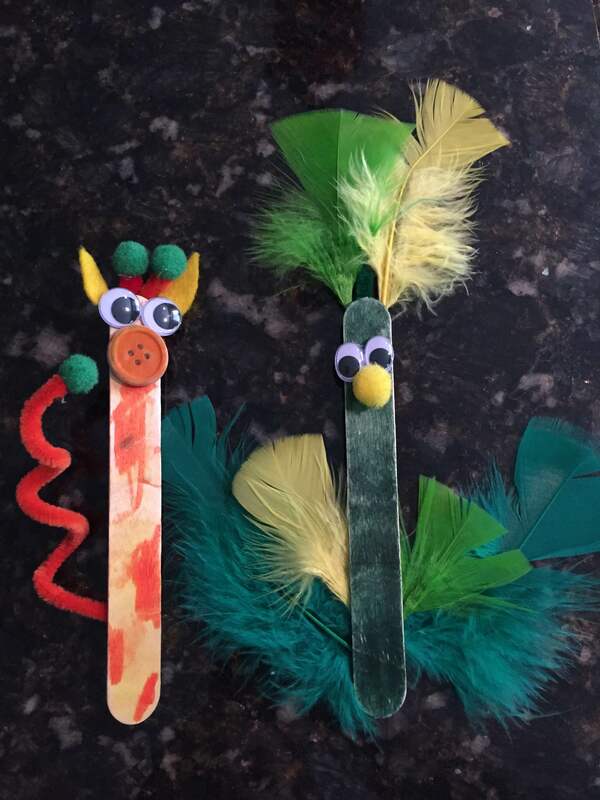 Blaise and I made stick animals while Laine painted. Saige supervised. Monday kicked off our new schedule, adding dance and swimming classes to our week. Brian went back to work and the kiddos and I left for Laine’s first dance class. She had been asking to take ballet so we signed her up. 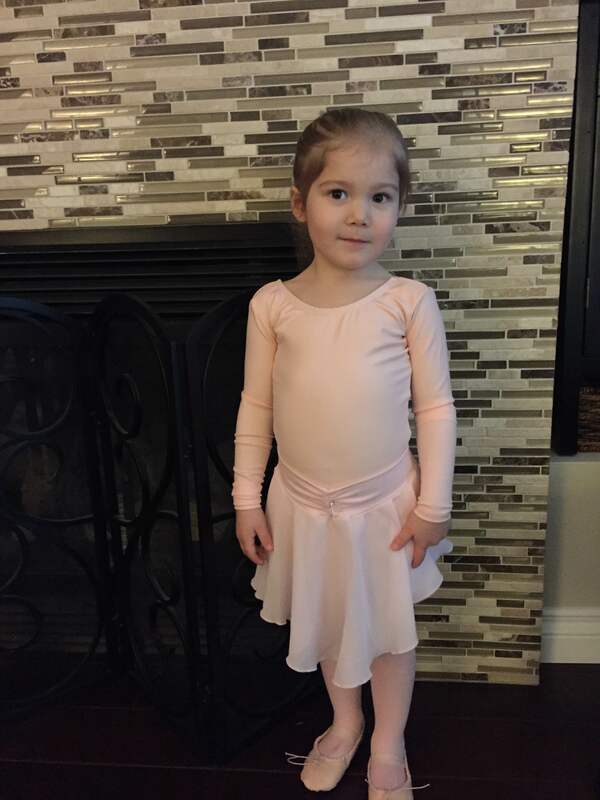 The entire time since signing her up and starting class, she kept saying she couldn’t wait to go to dance class. And how adorable is she in her outfit?! When I signed her up, I asked Blaise if he wanted to take the class too, he said no. And of course, as soon as we got to the dance studio and Blaise saw the class start, he asked to join the fun. The studio was great; they let him into the class. I love that it doesn’t even faze him that he is the only boy in a class of seven little girls wearing pink tutus. 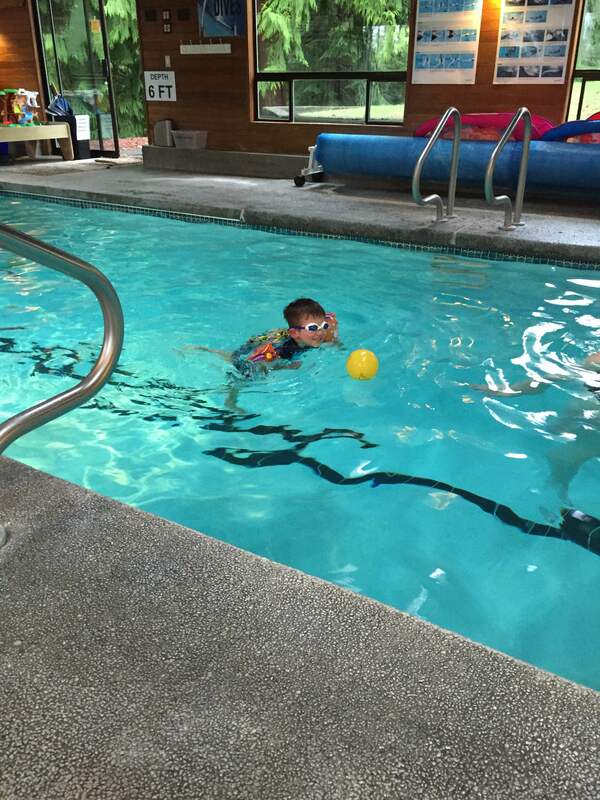 The kiddos had been taking swimming lessons through the City of Issaquah, and still would be if they hadn’t closed their pool for renovations. 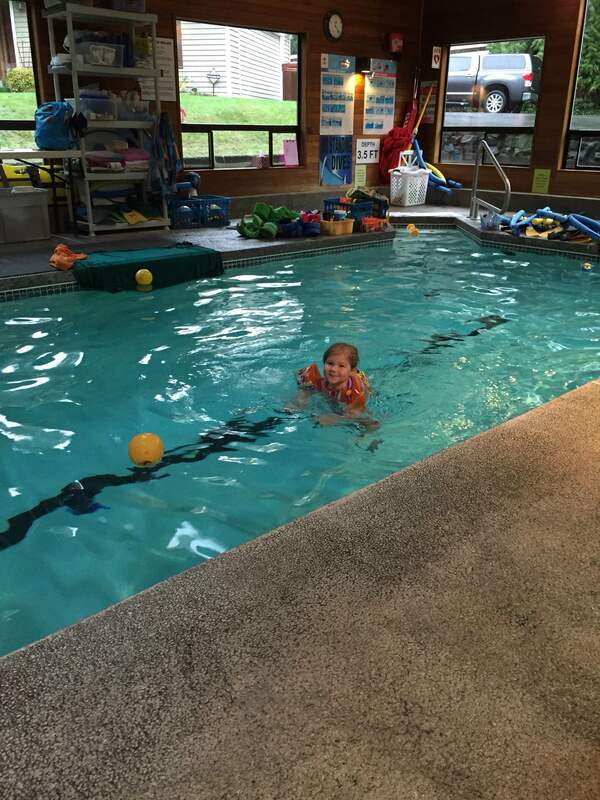 Several of our friends take their kiddos to swimming lessons at Tiger Mountain Aquatics and say nothing but great things about it there. When I contacted them to find a class for the kiddos, they were fully booked and we got wait-listed. Sunday night I received an email saying they had two openings on Mondays at noon… which is immediately following dance class. Normally I wouldn’t book two activities in one day but we’re going with it. The lesson was great! They limit the class to three students but it’s just Blaise and Laine so it’s basically a private lesson. Despite Laine saying she didn’t want to at first, she was a trooper and both did very well (especially for being tired from dance class). Tuesday kicked off the winter session of school. Thankfully it wasn’t as cold as it had been but we still bundled them up to be toasty warm since they are outside the whole time. 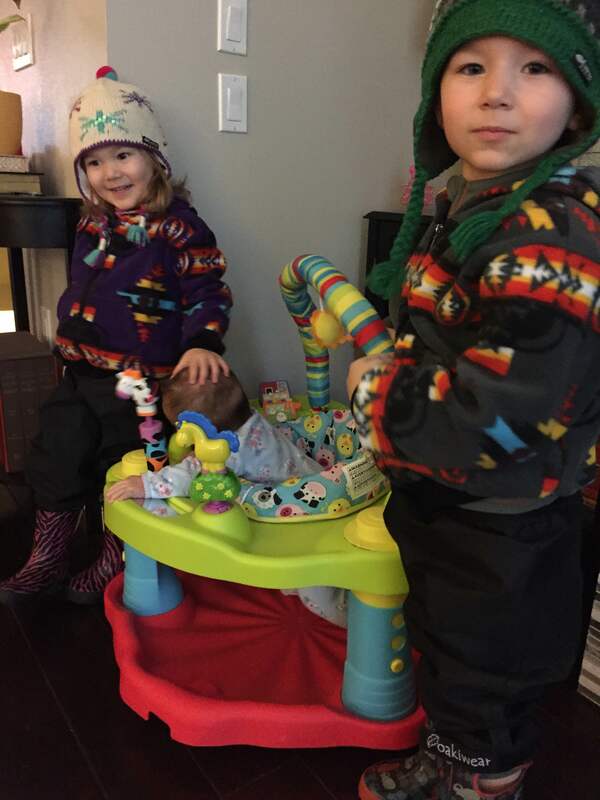 Brian had taken them to REI to pick out new hats and gloves the week before so they were excited to wear them. School was great, Brian said drop-off was smooth with Laine heading to the art table and Blaise telling him it was okay to leave (now). While they were at school, Saige and I hit the trail. 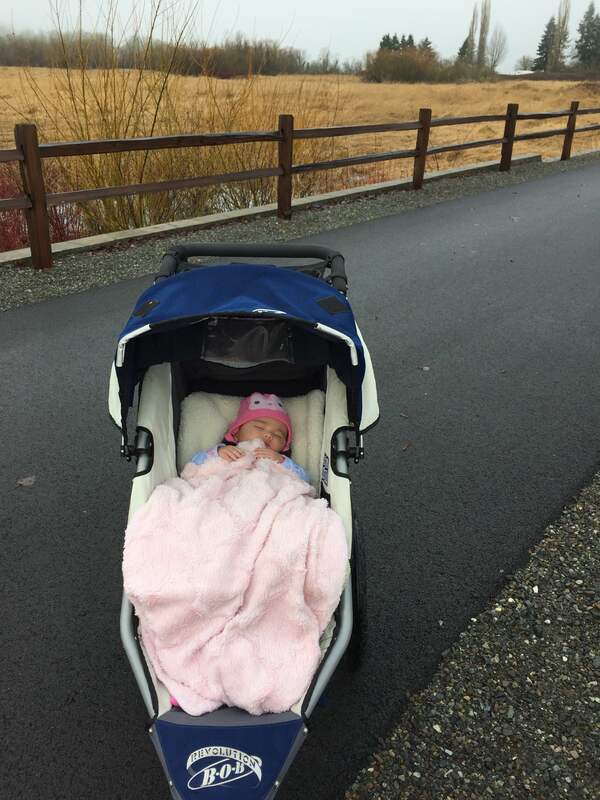 It was her first outing in the BOB stroller and her first time on the trail. She stayed awake long enough to know she went and I was able to get a run in while pushing her along. Nothing fancy or long, just enough to feel like I might get my fitness back… especially after pushing her up the hill coming back home. 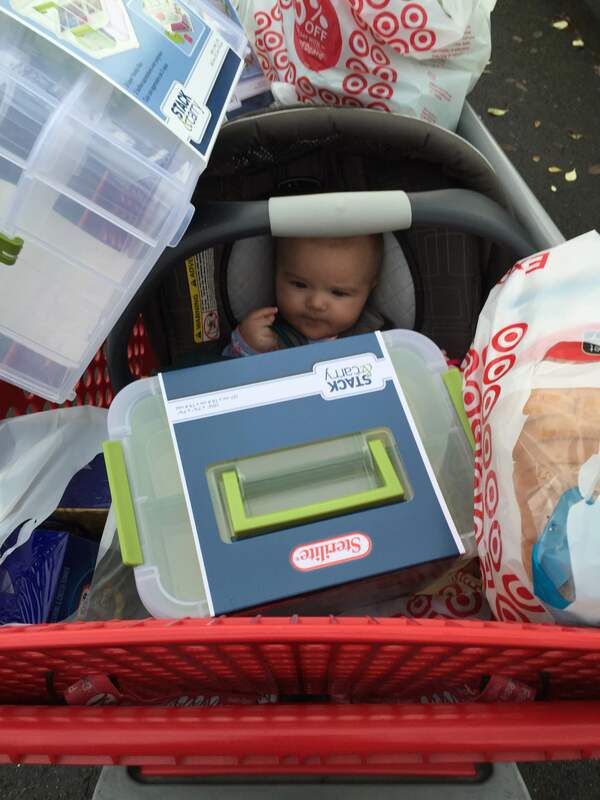 Saige and I stopped at Target on our way to pick up the kiddos from school. Indoctrinating her young as a Target shopper. 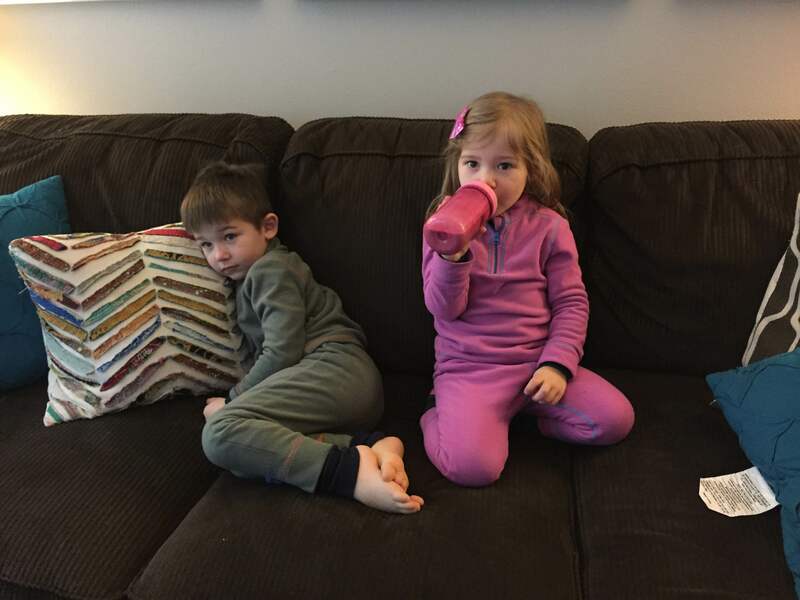 Thursday was day two back to school and the kiddos came home zonked from a busy week, ready to relax for the day. Blaise even admitted to being tired and said he wanted to lie down on the couch. It was an afternoon of watching Annedroids on Amazon (great show!). Brian’s mom came into town Thursday night and we had a semi-lazy, at-home visit through the weekend. 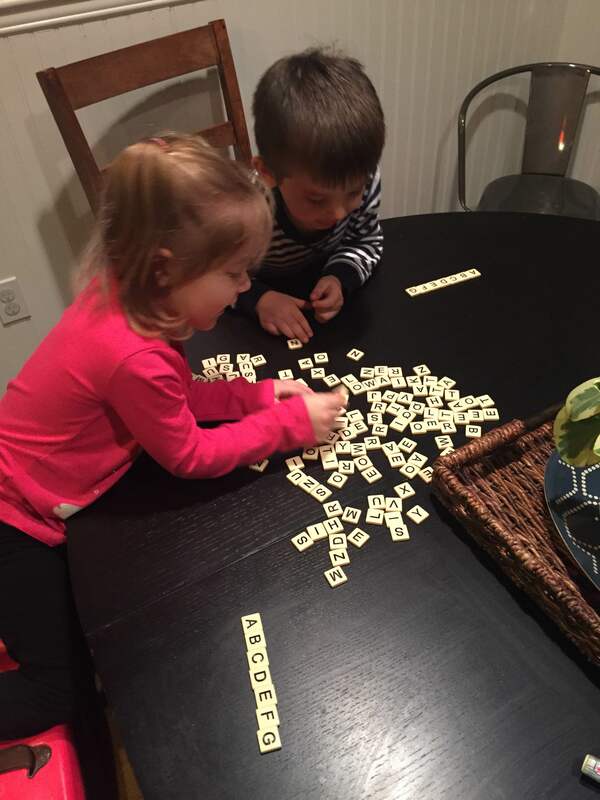 The kiddos worked on their letters with Bananagrams (my latest for homeschooling purchase). Sunday was somewhat typical: Saige and I slept in while Brian and the kiddos played downstairs. We had a late breakfast, Brian ran on the treadmill, and then we all headed down to the trail. I wanted to run and the kiddos wanted to show Grams the dock and feed the ducks. 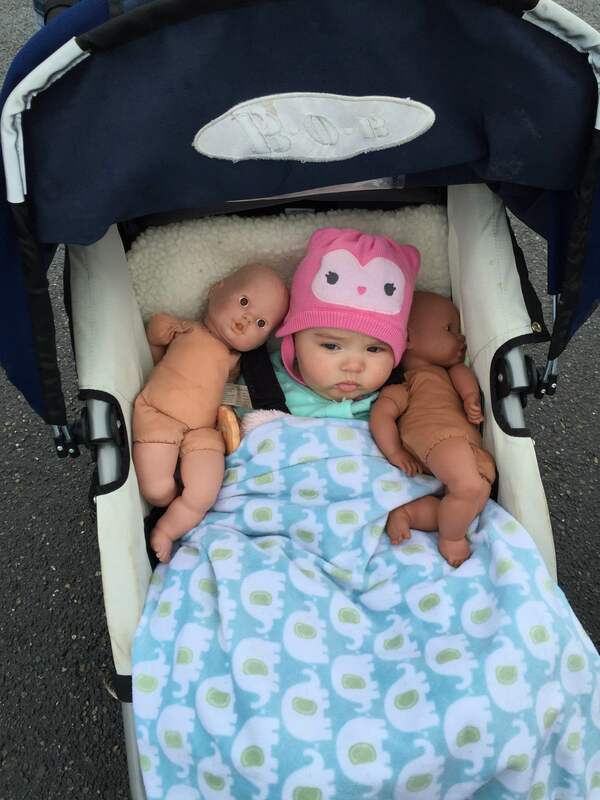 Laine took along her babies (that she hasn’t played with in months) and had them ride with Saige.